Today through karma and such I was sent this excellent non chicken recipe. Would you eat koi carp, ganesha, holy cows, kosher lobsters (not yet available) etc. Do you practice extreme ahimsa? Are you fanatical or do you eat the occasional snail? I used to be a rabid carnivore, and ate absolutely every bit of meat - wherever from, whatever it was - because I was taught, in a non-invasive, non-dictatorial way, to try everything at least once, before deciding whether I like it or not. My dad even counselled me to go further and, if I didn't like something, to then try it prepared in 2 other different ways, and THEN determine whether it was in fact the actual ingredient, or the way it was cooked. If, after trying it three ways, you still don't like it - then you really do NOT like it. 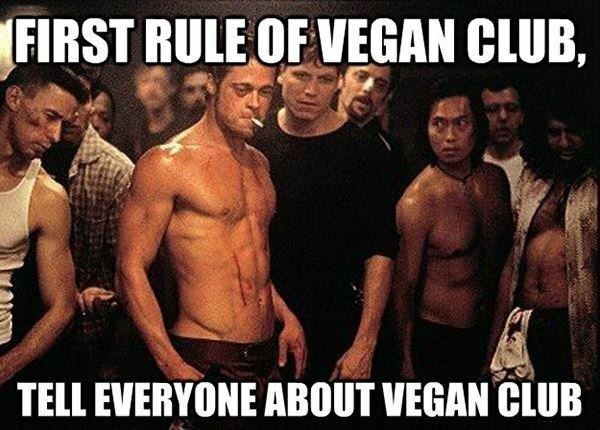 I stayed vegetarian for 15 years. During that time, I did eat some meat, but it was under circumstances where I had no choice - a pre-determined menu, or an unknowing host.... And thus was consumption rare and very limited. But I was to all intents and purposes, vegetarian. Now I got LCHF/P stuff goin' on. So I eat fish (sorry @lobster, but you were included once!) and poultry. I do my level best to buy organic, and "responsibly caught fish". But meat does form a part of my diet now. I can't hand on heart declare I feel entirely comfortable with it. I do get pangs of guilt. I sincerely feel the responsibility of it, and I consider myself a hypocrite, to a degree. But that's my bag to carry, and what others do, is their bag. As to what I would or wouldn't eat, under normal circumstances, I am guided by The Buddha's caveats, with regard to which meats can or cannot be eaten. Everything else, 20 years ago, would have been fair game. Incidentally, I did see a report in a paper that flood victims in Texas were scrambling to buy food in supermarkets and cleared the shelves, locust-style - but a whole section of vegan foods was left completely untouched. As they say in Texas if it ain't prime beef it ain't food. I prefer a vegetarian diet but couldn't, in good conscience, continue to do so. Since moving back to the reservation the community center sporadically gets large quantities of fish and/or meat (salmon for instance, elk, moose and deer both from hunters as well as quickly treated road kill). They don't have a freezer to keep it in and so, what doesn't get picked up quickly spoils and is thrown out. When my wife gets off work and sees activity at the community center on her way home, she stops in and saves some from the refuse pile. We had salmon last night. Don't care for salmon at all (bones) but it's food and eating it insures it didn't go to waste. Just sayin' I thought this said "bugie casserole" which my brain translates to "boogie" aka "boogers" and I wasn't sure I wanted to read. I, too, an LCHF but I also do a lot of Ayurveda and I eat seasonally. Wild rice season is coming, and I love ricing. Our state has a lot of requirements for harvesting it (it must be done Native-style) to avoid damanging very sensitive rice patches. Not low carb, but it is a ritual and process that connects me very much to the natural work, so I do it, keep a little for myself for an indulgent batch of cheesy wild rice soup, and the rest goes to the local tribe, as it is part of the reservation income. It is really not the ideal time of year for my diet, lol, as my garden is producing plenty of root veggies right now, along with being able to forage wild plums, apples and chantrelles. Which are fine, but the plums and apples not as much! They are, of course, much smaller than store-bought and much more flavorful so I allow myself to have a couple here and there. Overall, I try to stick close to nature with my eating habits. I do not hunt, but I have family that does and they always share in trade for help with wood splitting and stacking. Otherwise, we source meat as responsibly and as locally as we can. We do fish, sans lead tackle. As @federica said, it's not something (fishing or eating meat) that I feel 100% terrific about, but it is what my body prefers so I do the best to balance my bodies needs with my values and accept my karmic responsibility. Your Thread title was disturbing, @lobster. We had two parakeets (similar if not same as budgies). But yes, I eat meat. If the world ended and the parakeets were all we had left, I very well may decide they're too small to bother with...yeah. (Although the yellow one did chomp down on my finger severely one time...nah, still - too teensy! Your Thread title was disturbing, @lobster. Being kind to animals, for many of us extends to not eating friends. It is very much a personal realisation and practice. As has been noted, some of us eat according to circumstance. I have been vegetarian, even vegan for a short while. At the moment budgie is not on the menu. Fish and occasionally meat is. I do not hate murders, vegans or cows. This is samsara. I do not require lectures from soldiers, vegans or those who advocate we 'eat the rich' if poor. Being kind to animals, for many of us extends to not eating friends. For some of us it is also about the practice of Right Intention, which includes harmlessness. And of course harmlessness is also the spirit of the five precepts, avoiding harming ourselves or others. If we buy meat then we expect somebody else to break the first precept and do wrong livelihood on our behalf. To me that looks like hypocrisy. ... 'food' also includes nutrition, emotional needs/nutrients ... comfort eating, consuming dharma ... being distubed by fasting fast food dieting etc.